Fossil-based energy sources, such as coal, oil, and natural gas have powered most of the advanced world’s infrastructure and technology for the past century. Replacing these energy sources with renewable substitutes is one of the major efforts of mankind to maintain the growth of the modern world. Two key reasons for this transition are the reserves of fossil fuels – especially crude oil – are inadequate to the extent that they will eventually be depleted. In addition, fossil fuels enhance the amount of carbon dioxide in the atmosphere, which may already be having many adverse effects on the Earth’s climate. This is especially problematic as more and more of the world is becoming dependent on these fuel sources. It has been predicted that petroleum reserves will last only for 40 years and natural gases only for 60. Further, there has been a serious threat to using nuclear power after a major earthquake in Fukushima (Japan), which induced a giant tsunami that eventually destroyed several of Fukushima’s nuclear power reactors, causing nuclear pollutants to spread over a very large area. Therefore, there is a rapidly growing market for sustainable, renewable, carbon-neutral energy sources, such as solar energy, wind energy, or biofuels. Solar radiation is one of the most promising alternative resources of energy, mainly because of its abundance and reliability. Therefore, harvesting energy directly from sunlight using photovoltaic technology is considered to be one of the most significant ways to address the growing global energy requirements using a renewable resource. 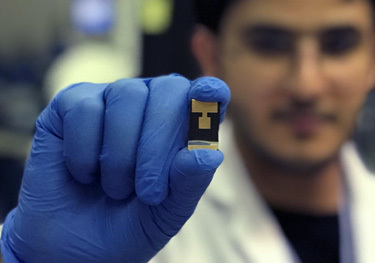 Solar cells are devices that convert solar energy directly into electricity, and significant strides have been taken to improve the performance of these devices, especially by using silicon. However, silicon-based solar cells remain an expensive solution, which may somewhat prohibit wide-scale implementation. There is a need to create low-cost, high-performance materials in building solar cells, which can address the financial and refining demands. Organic-based photovoltaics (OPVs) have emerged as a promising, cost-effective alternative to silicon-based solar cells, as they can be constructed from inexpensive materials and printed onto flexible substrates. However, OPV devices still pose the problem of low efficiencies and limited lifetimes. As a solution to this key problem, we propose incorporating highly stable, self-assembled nanowires and nanotubes in order to control the nanostructure of OPV devices and assure efficient electron and hole transport within the devices. It should be possible to scale up such a self-assembly-based approach in a cost-effective manner. For example, simply printing the precursor materials for the porous nanowire frameworks onto the devices allows the precursors to self-assemble into functional active layers. These one-, two-, and three-dimensional frameworks have quite high thermal stabilities, and hence, the resulting devices are also expected to resist long-term degradation. It is not unlikely that using such a technology to control the nanostructure of OPV devices will lead to high efficiencies. Since OPVs could potentially be produced at a significantly lower cost, they may be capable of to securing a large portion of the world-wide energy market, particularly now that many governments are planning to employ carbon emission trading schemes or taxes that will make renewable energy sources more competitive with existing fossil fuel power production. This project aims to develop wholly synthetic redox-active macrocycles that are robust, thermally stable, and exhibit semi-conducting properties to form the basis for the next generation of photo-active materials, built upon organic-based photovoltaics. We aim to elucidate the fundamental factors governing efficient charge mobility in photovoltaics and explore the effects of i) rigidity/flexibility of the redox-active units; ii) distance between the redox-active units; iii) geometry and chirality of the redox centers; and iv) energy gaps between different redox-active units in the macrocycles. Achieving success in this project will provide fundamental insights into the molecular basis for creating efficient solar-power technology and will drive the development of novel photo-active materials as well as increase the economic contribution of renewable energy technology. Barnes, J. C., Dale, E. J., Prokofjevs, A., Narayanan, A., Gibbs-Hall, I. C., Juríček, M., ... & Stoddart, J. F. (2015). Semiconducting single crystals comprising segregated arrays of complexes of C60. Journal of the American Chemical Society, 137(6), 2392-2399. Holcroft, J. M., Hartlieb, K. J., Moghadam, P. Z., Bell, J. G., Barin, G., Ferris, D. P., Algaradah M. M., Nassar, M. S, ... & Thomas, K. M. (2015). Carbohydrate-mediated purification of petrochemicals. Journal of the American Chemical Society, 137(17), 5706-5719. Wang, Y., Sun, J., Liu, Z., Nassar, M. S., Botros, Y. Y., & Stoddart, J. F. (2016). Symbiotic control in mechanical bond formation. Angewandte Chemie International Edition, 55(40), 12387-12392.